WordPress has done this 2014 report for everyone’s blogs – it’s interesting to see the stuff that garnered interest (feminism, veganism, board games) and put the year’s writing into perspective. The big gaps in writing from August on are pretty sad, but that’ll hopefully be different in the new year! Plus I hope to add some more museum writing to my stuff. In case you missed it, I wrote about my favourite 2014 releases here, and I wrote a bit more of an article on my top 5 2014 releases over at the Daily Worker Placement! And now..
My 2014 gaming wrap-up part 2, honourable mentions: Stuff that didn’t necessarily come out in 2014, but I tried out for the first time! (Many from last year’s wishlist.) It’s not all about the new to the market, but also new to me! Some of this is fairly recent, but there’s a few oldies in here. * Concept: A party game of guessing – but instead of a charades-type scenario, you have a board of icons/symbols/shapes/colours etc to use to explain the ‘concept’ of what you’re trying to get the other players to guess. (Chosen from a card with some easy/medium/hard things listed.) I can’t get enough of this game! I don’t understand why it didn’t win the SdJ, it’s such a solid game. One of my favourite group/party games now! * Arkadia: This is a really lovely game, with beautiful components. That makes it quite a pleasure to play. I enjoyed the unique aspects of the gameplay, building up the structures and using cards/builders for progressing – but I didn’t feel drawn to it enough to really want to play it again some time, unfortunately. * Kreta: Quite an interesting mix of hand management & area control – timing things right so you’ve got helpful resources and are in the regions that will score, and trying to make that scoring happen when it’ll benefit you most. I think I would like to try this one again as I really liked the gameplay, but was terribly void of strategic understanding. * Goa: This is definitely one of those times I learnt a game when I was too tired to really understand it, and by the end I realized that was a bad idea, but want to try it again. I love the way the tiles are laid out, and accessed through auctioning, and you need to strategically gain things through those auctions to power up your own player board/tech tree thing. All the things about it are cool, and I want to make sure my impressions aren’t coloured by a bad first-time play for this one. * Boss Monster: There’s some rad stuff about this game – the throwback pixel art, the concept that you’re a dungeon boss trying to lure unsuspecting adventurers into your dungeon so you can whack ’em, how easy it is to learn/teach.. But unfortunately this just didn’t click for me – it’s something that seems like it should, but it just sits there on the shelf overlooked now. * Legends of Andor: I love Michael Menzel’s art! So it’s nice to see a game he made AND did art for! There’s not a lot of cooperative fantasy-themed games, and this one’s got a nice balance of genders for characters to play, so I was excited to try this out finally after it’d been on our shelf for too long in shrink. I do like the gameplay – the way you get around the map, the way combat etc plays out, all of that was good. But we played through a bunch of scenarios and I just haven’t been interested in getting it back out again. I guess I was expecting something more engaging, and was disappointed it wasn’t D&D in a board game. * Cuatro: Yahtzee meets four-in-a-row on a flat board – but you can also stack on top of other player’s pieces to get your four-in-a-row! We played this at the Board Room and it’s an excellent quick filler, with buckets of dice rolling. Just the ticket if you’re in the mood. * Mai-Star: I believe I’ve mentioned at some point that I really enjoy games that have cards with multiple uses, and Mai-Star really does that well! Become the most famed Geisha by attracting the best and most demanding guests – playing down character cards and attracting them with the values of other cards – performance, service and intelligence. Those guests will then give you benefits as the round goes on. 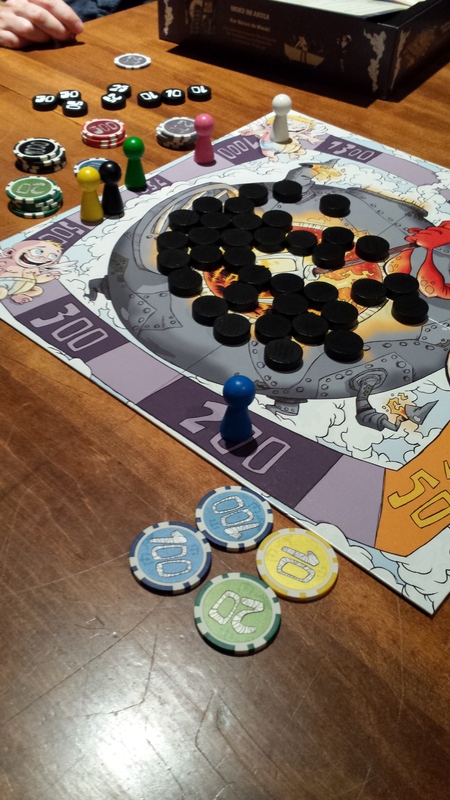 I really liked this – I can’t see if it’s got a place in our collection because it doesn’t really fill any gaps as far as small quick card games, but I’d play it again at an event for sure! * Auf Teufel Komm Raus: What an enormously fun betting/push your luck game! All the ‘coal’ in the middle are printed on the other side – either numeric values, or a devil symbol. At the start of each round, everyone reveals the value of coal they think they’ll be able to turn over without busting (ie. revealing a devil). Even if you hit your amount you can keep going! Or you can pass out to make sure you get a return. SO GOOD. I wish this was an English release, but we had fun playing with our friends in Halifax who own it. * Tokaido: I seriously fell in love with this game this year, I wish I’d tried it earlier! One of the great pleasures of this game is in the relaxing play and that it’s a different enough little journey every time that it’s still nice to come back to over and over, similar to something like Carcassonne. The premise is that you’re a traveler on the East Sea road in Japan, moving along the action spots and stopping for meals at particular junctures. Actions range from painting landscapes, to visiting hot springs, encountering other travellers, visiting temples and collecting souvenirs. You can choose to poke along slowly, or jump ahead to take the action you really want – remembering that it’s always the person in the last spot who’ll take the current turn. It’s truly wonderful – depending on the ‘traveler’ you have each game (they all have special abilities/benefits) and how many people you play with, it’s always a new, yet familiar experience. I will always be up for a game of Tokaido! * MarraCash – All these little coloured wooden customers line up around the outside of the board waiting to come in and shop – you need to try and bid to purchase the right coloured stores in order to attract them as they enter the neighbourhood. The premise seems simple, but it was actually a terrifically hard game to make the most of (or at least I found it that way!). Interesting, but not enough to play again. * Campanile – This was a pretty interesting little card game! You are aiming to build up towers of different types, but the amount you build (1, 2 or 3 cards) determines the amount you can bid on what towers you think will win, and affects the new building type cards you’ll take. It really gives you some tough decisions to make on what is otherwise a very simple little game. * Luchador! Mexican Wrestling Dice – Rolling dice! Flipping out! PINNING!! I played a tag-team 4 player game of this and it was ridiculously fun. You roll dice to see if you hit your opponent, and there’s a variety of special moves you can pull off if you roll with luck. Light and a fun filler, especially when you just want to let loose and roll dice. Finishing up our Halifax stay with @jpdecosse at @theboardroomgc, chilling out and trying "Luchador!". * New Haven: Players share a resource board, which they build up during the game by placing tiles strategically to collect an optimum amount of resources on each of their turns (bordering your tile with similar resources bumps up the amount). The number of resources are indicated on a track, and spent immediately to place numbered tiles on your own player mat in order to try and fill up rows and columns for completion points. A nice light game with a balance of strategy, luck & player interaction. Lovely! * Concordia: I really enjoyed the interesting mix of hand-building and working that together with the map & gaining resources/currency. There was a fine balance there that I tried to get, yet failed. I think had I been paying more attention to the end game card bonus scoring then I might have fared better. I’m not sure I’ll get this to the table again to see how it plays multiple times – there’s many more heavier games I want to try first. * Ab in die Tonne – Look, if someone had sat me down and said I’d have a great time playing a game about stacking garbage in a can I’d have thought they were having me on. But it’s seriously great! Each player has a hand of three cards (from a deck ranging from 1 – 10), and each round reveals one simultaneously with the other players. Then from lowest to highest, each player picks one type of trash (milk cartons, apple cores, cans, bottles) and places a number of pieces equal to the number revealed into the garbage can. If you make everything collapse, you take a penalty token. If you happen to place the last piece of trash in/on the can without it collapsing, you get a bonus! SO MUCH FUN. German kid’s dexterity games are so, so good. * Robinson Crusoe – I really like this, but don’t own it – so it’s hard to get back to the table, especially when gaming with new releases to try and different people with different tastes. I think this is a really finely balanced, challenging game. If you like how tough Pandemic could be, this might be something you’d like to try – everyone struggling along together to eke it out to make it through to the end of the scenario. I’ve only tried the one scenario so I’m not sure I can 100% thumbs up the game, but I like the gameplay and the art/theme really ties it all together! * Pathfinder Card Game – An adventure/rpg-ish card game based on the actual RPG Pathfinder system. I’m not sure how it compares to the RPG itself, but it’s a pretty neat structure for an adventure card game. I especially like the fact you can level up your character and develop your deck if you want to play a sort of ‘campaign’! I’ve got to try and get this to the table again, perhaps just for me and Adam to play through our own mini-campaign, because it’s not likely we’ll play past the first scenario with anyone else. I want to make sure that it can really give the feeling of playing through an adventure too, because I haven’t felt that so much with the little experience I’ve had (but that was a confusing new game where I didn’t really get to immerse myself). * A Study in Emerald – I am ashamed to admit that I got this as a belated giftmas present last year from Adam and it’s sat on our shelf in shrink since then (we’d played it through on a friends copy and been interested by it). Part of the problem, I think, is the complexity of it, and how long ago we played – it means that we’re going in as newbies again and really need to familiarize ourselves. This is a goal for 2015 (sooner rather than later, I hope) because I really do enjoy the game and theme! * Forbidden Desert – It’s hard to believe that I tried this out as a prototype a few years ago now! I love the final published copy (it didn’t vary too much from the prototype if I recall correctly) – a nice fresh take on this style of light co-op game, while still keeping it fun and challenging. I love the new gameplay with the sand, and the ominous feeling of trying to keep up with that! So great. Highly recommend this. 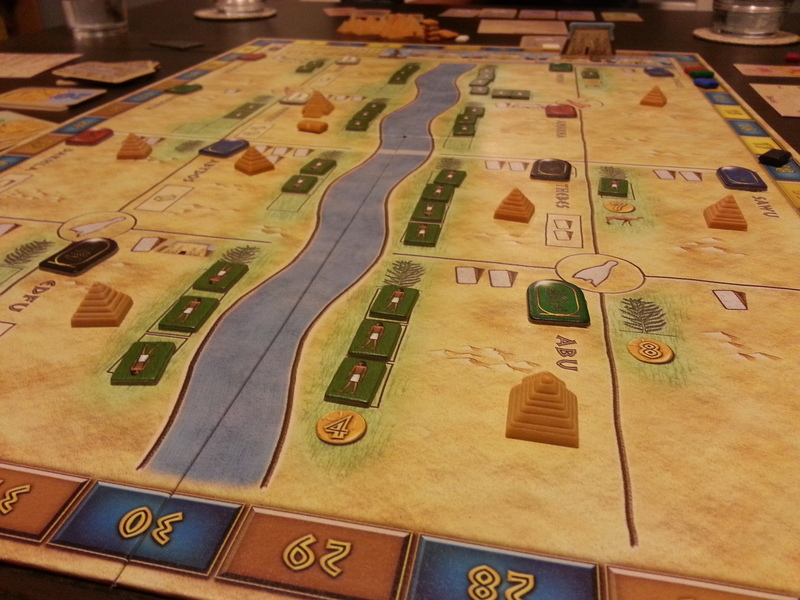 * Amun Re – Quite a blast from the past (well, 2003) – I’d never tried this before, and played it a few times this year. A balancing act of trying to bid on juicy territories, and also make sure to get points from where you’re at on the board and how your pyramids are coming along.. and how you do in making sacrifices to Amun Re! This one’s a keeper. * Blood Bowl Team Manager – Here is a little known fact: I love the Bloodbowl board game. I used to play it endlessly when me and my BFF lived with our friend Jamie, who owned a very rare copy (and I never did get my own because it was so filthy expensive to Ebay one and have it shipped to Australia). So when I heard about this, I got pretty excited! While it’s not moving minis around a board, passing an actual wee ball, it’s the closest a card game could get. It’s a great port of the original game, with all of the theme and ideas baked in – it’s terrific! Criminal we haven’t played this one more, but I sometimes just don’t feel in the mood for it. I must change that in 2015. * Trains: I don’t have any problems with deck building (unlike some who are fatigued on that game type), so I’m always willing to give a new one a try. I really liked the role the board played in this game – it felt like it really gave some purpose to how you build your deck and gave a little more structure to the game. I wasn’t quite sure of the strategy, so I think going back for multiple plays would be far more rewarding – but I haven’t had a chance to play it again. * 8 Minute Empire – I want to rave about this game because I really do like its simplicity, and that it’s a nice little puzzly light strategy game to play. But I don’t LOVE love it. It’s good, but for some reason just not good enough that it hasn’t hit our table more than a couple of times. Maybe I should rectify this in the new year to see if my feelings change about it. Not ready to get rid of it just yet. We’ll see! * Space Cadets Dice Duel – I have never played the full game of Space Cadets, because it seemed like such an investment of time. Dice Duel has the same flavour, and adds in a frantic Galaxy Trucker/Space Alert feeling with the hasty rolling of dice to beat your opponents to the punch. We played with 6, and I can’t help feeling it might have been better with 8. I was the captain on my side, and felt a little disassociated from actually doing anything, rather than just enabling my team mates to get stuff done. But it was a fun/funny experience! * Two Rooms and a Boom: I played a round of this social deduction game and was kinda flummoxed by it. I was a basic member of the red team, so there was really not a lot for me to do. Plus, the president and bomber both started in the other room – so there wasn’t much we could do! I think had I tried it again I’d have found some fun & depth to it after trying different roles, etc. Alas, I will have to wait for another chance to play it again and see what it can do. * Going Going Gone: It’s criminal it took me so long to try this game. Madly tossing cubes in cups to bid in auctions is the best! Set collection is good, secondary fun. A great, easy to understand game with a lot of excellent action going on. I must try this again to see if it’s worth getting. * Blueprints – So simple in design, but with enough going on to make it interesting and fun to play. You get a ‘blueprint’ for a structure to build with dice. Each round you take a die from a publicly available pool and play it to your structure behind your screen. Each type of die has different scoring benefits that will come into effect once everyone has 6 dice on their blueprint. Really solid, but unfortunately not great with 2 players. So, I gamed a WHOLE BUNCH this year, obviously. I’m hoping to really do the same in 2015 – getting to the Gathering of Friends and hopefully BGGcon, making sure to put an emphasis on playing what is in our collection, and also writing more about games as a contributor to my friend’s site the Daily Worker Placement should help! Thanks for reading, folks. I’d love to hear your thoughts on this year in gaming. 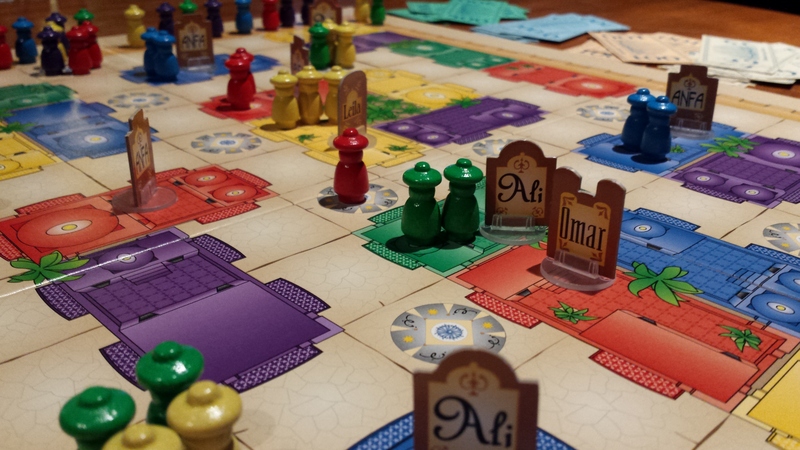 2014 board game wrap-up – games from 2014 & my wishlist. Yeah, there’s been some radio silence here these last couple of months. But that doesn’t mean I haven’t been gaming all that while. Here’s my thoughts on what I’ve played/want to play from the releases of 2014 as listed on Board Game Geek. Plus a little bit of honourable mentions, all of which were first-time plays even if not 2014 releases. If you count all that – including multiple plays of them – plus replays of stuff, boy I gamed a lot. A LOT. Also you’ll notice that I post a lot of pics on Instagram of what I’m playing, hence their inclusion here to break up the text a bit! * Dead of Winter: There’s a heck of a lot of zombie games out there, and there’s few now that I will actually play because I’m burnt out on them. Dead of Winter is different though, it brings the stress and fighting and anxiousness of a zombiepocalypse situation – something akin to the tone of the Walking Dead comics, and brings it to this almost entirely coop game (there’s a traitor aspect). I legit had a stressful time playing this game, perhaps because of the mix of personalities and whatnot. I will have to try it again, as I think that can really colour my experience of a game – as I really think this is the best implementation of the theme out there that I’ve tried. * Splendor: The theme in this game could really be anything (see?) – but it’s super easy to teach, pleasant to play and it’s something that’s not easy to just line up and win game after game – it just depends on turn order, how cards come out etc. I think this is a great gateway game, and I’ve taught it a few times to a range of people – and while some gamers more ‘into’ the hobby tend to avoid it, I don’t know anyone that actually HATES it. It’s just not for them. * Five Tribes: Taking a euro with an Arabian theme and giving it a fresh twist, this game relies on displacing workers already on the board, rather than each player placing their own workers. The strategy of moving these workers allows you to perform certain tasks, and all of these work toward the generation of points. 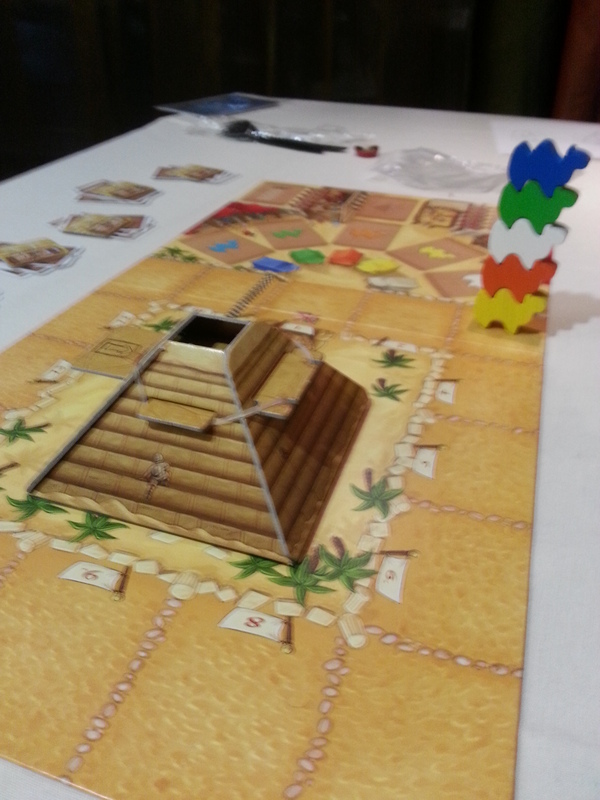 White meeples allow you to obtain Djinn which have special affects; green meeples allow you to buy from the market; blue meeples are architects that earn you money from surrounding buildings; red meeples are assassins that can be used to eliminate meeples on the board or in front of other players; yellow meeples are worth points at the end of the game (majority). With all of this and a bid for player order at the start of each round, there’s a wonderful balancing game to make the most of your moves. While it’s a tough one to teach & I feel the inclusion of the slave cards in the market is totally uneccesary, I still think this is in my top of 2014. * Istanbul: This is a really solid game, with enough variation that replay is interesting (the board is made up of large cards, so can have a variable format). The idea is you take your ‘Merchant’ and stack of ‘apprentices’ and move either one or two spots and drop off an apprentice. You then perform the action/get the benefit from that location. It’s a delicate balance of getting around making sure you don’t abandon your apprentices and can’t pick them up, yet making sure you’re doing all of the things you need to do to get ahead in points. It’s a nice simple game that is enjoyable to play, as you move about amassing resources, cashing in for money and points. * Imperial Settlers: I played about 2/3 of the way through this game, and missed a couple of pretty key things during the rules explanation (first time teach, loud environment) so I don’t know I can give a great review – but I enjoyed what I did understand and play through, so really want to get this to the table again early in the new year. Very cool little light strategy civ game. Finally trying Imperial Settlers! Yay. * One Night Ultimate Werewolf (& Daybreak expansion) – this has become one of my favourite large group/party/social deduction games. Almost everyone I’ve introduced it to has loved it and I’ve played it for hours at a time with some groups! I tried the prototype of Daybreak in April at the Gathering of Friends, and I’m looking forward to picking up a copy in Feb when it goes to wide release (it was Kickstarted in September). * Marvel Dice Masters: I have played this just once, and haven’t found anyone into it enough to play with me again 😦 I played through the intro scenario to get a feel for the game, and while it wasn’t particularly interesting it gave me an understanding of the game – and I dig the fun and simplicity of it. Now I really gotta play it again, it annoys me that it’s sitting there unplayed! * Castles of Mad King Ludwig: Righto, I think it’s understating it to say I was impatient to get a copy of this after playing the prototype in April. This is a great game of tile laying to build up a castle full of rooms to meet the Mad King’s desires (AKA the overall goals for that game – drawn at random – and a number of personal goal cards in your hand). It’s similar to Suburbia in that way, but way more hilarious and ridiculous, and it adds some fun stuff with the start player (master builder) each turn arranging the rooms in the pricing order they wish, and having other players pay them. So much fun! One of my faves, and I default to it more than Suburbia now. Oops. * King of New York: Yeah, this was ok! I enjoy King of Tokyo (I don’t own it, but I’m happy to play it when people suggest/bring it out! ), and this is an interesting variation. I think I like KoT more because KoNY really makes there be more to do, and it takes less away from the feeling of monsters wrasslin’ and adds in all the extra stuff that, while thematically great, slows down the game and that is a bummer. * Cash ‘n’ Guns 2nd ed: This new edition is great. There’s some new stuff going on which I think really refreshed the gameplay for me. Each player now gets dealt a random special power to use once per round, there’s also some new loot in addition to money (paintings, diamonds, and also med kits to heal up!). There’s also a ‘Boss’ role that can be claimed as part of the loot, and it lets you tell a player to re-aim during the shooting phase. I really had fun, and I like the new character art way better! * Sheriff of Nottingham: Yaaaaaaaaas!! Earlier this year I played Hart an der Grenze, which is what SoN is based on. It was fun, but some of the theme was bordering on racial stereotyping, and there were a few things gameplay-wise that could’ve been improved upon. Basically, SoN has a theme that still works awesomely and doesn’t feel weird and too real, and improved stuff to make it a really great game. If you don’t like being sneaky and lying and trying to bribe people, this isn’t for you. Sometimes I really dislike negotiation games, but I think this is low level enough that it stays fun. Gotta get that mead smuggled through..
* Alchemists: I still haven’t played the print version of this! While there was a LOT going on (worker placement plus deduction and a little resource management) I thought it was pretty neat, and I love the use of the app in-game, and that it gives you a fresh combination for deductions each game. I felt a bit overwhelmed by it all, but I think it’s a unique and fresh take for a game. * Deus: I like games where cards have multiple uses! (Except Race for the Galaxy which makes me weep with frustration at its glyphics.) This is a little civ game using a shared map – cards are used to make offerings to gods (getting you ongoing benefits throughout the game) or to build on the board. It’s a good mix of stuff – it didn’t grab me so much I desperately want to try again, but I’d certainly be happy to sit down at the table for this one any time. * Pandemic the Cure: Matt Leacock has done such a great job at transferring the theme and general gist of gameplay from Pandemic the board game over to a very light and reasonably quick dice game. I’d say I would almost default to this game rather than regular Pandemic because it’s done such a great job at porting everything over and making it less complicated to play. Each role is well thought out, dice sides are distributed well for players and viruses, the team work is still at the forefront, and it’s still brutally hard to stop the world from being enveloped in filthy sick germs. Whee! So close to winning Pandemic the Cure.. Come on dice, don't mess it up. * Abluxxen: Holy cow I’m BAD at this game. The idea is you’re playing sets of numbered cards down in front of you – but if people play a better version of that set, they take them, and you have to draw the same number of cards from the deck, likely filled with unusable rubbish, therefore ending the game with a bazillion cards in your damn hand, losing the game. I don’t know if luck was against me, or I wasn’t playing down good enough sets to protect from being nicked, but gosh I had a tough time of it. I’m not sure I’d want to try this again. * Evolution: I like the idea of this game – forming a tableau of animals in a sort of ecosystem to see who comes out on top. I played a prototype of what’s probably close to the final version – it was a very light strategy game that had a few frustrating balance issues but was otherwise good! I’d try it again, but likely not own it. * Valley of the Kings: Deckbuilding, with a neat element of the structure of cards you can buy from (a 6 card pyramid, only being able to buy from the lowest row) – as you build up your deck, the cards in your hand can be used for their effect, or their money – the idea is to build up sets of cards and ‘entomb’ them before the deck runs out, because if they’re still in your hand at the end of the game they don’t contribute to points. So neat! I really like this, but we don’t seem to get it to the table enough. * Black Fleet: Playing movement cards, you maneuver your pirate/merchant ships around the board to collect goods, or bury them as treasure. You also get to move the navy ships to mess with the other players – but you must watch out for them doing the same to you! Beautiful art & pieces, very easy to learn, and fun to play. Enjoyed it, but not enough to own. * Lost Legacy: the Starship: This is essentially Love Letter with an added phase at the end of a round. I think the game’s okay, but I feel like there’s more fun in Love Letter than in Lost Legacy for some reason. It’s just okay. * Battle at Kemble’s Cascade: Space games are pretty cool, and this has a neat element of a scrolling space video game. Gimmicky but neat. Not gripping enough with the actual actions and gameplay for me to be interested in playing again though. More playtesting! #gof2014 #boardgames This time, a neat scrolling space battle game from Z-Man called Battle at Kemble's Cascade. Looking forward to trying this again. * Pagoda: This was such a pleasure to play! Building up pretty pagoda towers by strategically playing pieces of certain colours to claim for more points. That’s it! Very little strategy, but a nice 2 player game. Adam and I played this at the Board Room Cafe in Halifax. * This Town Ain’t Big Enough for the 2 – 4 of us: Aw man, Sen and Jay bust out all sorts of great games, even great MICRO games! This was part of a Kickstarter pack of micro games which I missed, but there were some extra copies available in the BGG Store so I snapped one up! It’s a basic tile laying area control game, takes about 10-15 minutes and it’s excellent! This is gonna be one of my go-to filler games now for sure. * Madame Ching: If you imagine something a little like Ticket to Ride on water, but change-able from round to round as far as where you’re at on the board, then you’re close to Madame Ching. The idea is to play down cards one at a time in ascending order of varying colours and values (some with bonus symbols to get cards that help towards game-end victory) to get your ship as far as you can across and down the board, which is an open expanse of water. I got stung by luck with cards the first time I played, but have enjoyed subsequent plays, and it’s a nice introductory level sort of game for folks who haven’t played much else before other than TTR or Settlers, perhaps. Art’s lovely, too! * Subdivision: I enjoyed this when I tried it in April, but the more I think about it, the more I realize I’m never going to care about trying it ever again. It’s in the same game family as Suburbia, but it’s far more self contained and it’s more about dice rolling and drafting tiles to build where you can rather than an engine-building tile laying city builder like Suburbia. A miss for me. * The Walled City: From local designers here in Southern Ontario! This is a beautiful city builder, where you’re trying to manage and build up/block off areas of the city with your workers inside for points, all the while managing your hand of cards with which you build all that stuff with. Really terrific stuff. * Card Wars – Adventure Time has a game, and Card Wars is it. All the other stuff is Adventure-Time-themed, but this game was borne out of the show itself, a wonderful animated and interactive game that Jake and Finn play against each other. The cardboard version of this game isn’t bad – but I much prefer the app version of this because there’s less fiddly card setup, it’s fun to see the animations and you can bang out a game quickly against the AI. * Arf! : When the designer of this game posted it was available for purchase, I jumped on board. A cute card game about getting puppies adopted? YES PLEASE. It could’ve just been that and I’d have been happy, but it’s actually a perfectly wonderful set collection game where you’re making offers of a variety of types of sets (lowest odd numbered card in a suit, best straight of a suit, etc) to puppies up for adoption to suit their particular mix of needs of love, food or housing – or a combination of both. At the end there’s points for the most of a certain numbered card, the most of a suit, and then for pairs or triples of puppies for whom you found homes. WONDERFUL. More please. I think it goes without saying I am excited by the theme of this game. * But Wait, there’s More! Imagine a party game where you’re pitching a product like you’re selling it on late night TV. With a hand of features like “now 50% more absorbant!” or “voice activated”, everyone chooses a feature to start with and pitches for the same product – a toothbrush, a car, a lawn sprinkler etc. Now the fun part – about halfway through your pitch with the chosen feature you must proclaim “But wait, there’s more!” and pick a random feature card to then incorporate into your pitch. The results are magnificent and hilarious. It’s got a pretty good appeal for most people, and can play with any folks who are interested in having a fun, creative time (if you enjoy Snake Oil, Apples to Apples – this will be for you). One of my favourite party games – I’ll be glad to have a copy in print sometime soon! * Munchkin Adventure Time: Aaahhhhh Munchkin. I really don’t enjoy it. But they did really put the fun of the theme into the game, at least. 1/2 a star. Man, Munchkin is ridiculous. But: Adventure Time! * North Wind: Hey bad luck! There you are, hiding among the really super neat components of this game. There’s a number of layers of straight up luck going on here – multiple die rolls for encountering enemies, pulling tiles for movement – that you can really get the short end of the stick and can’t do anything about it. It’s a shame, because it seems like a fun game otherwise – sail about in your cool looking ship, gathering resources and pirate captain prisoners to trade in for money in ports. We got a comp copy of this, and I feel like we’re gonna have to house rule it a bit to stop some of the luck from ruining it for one or two players entirely. It took me like 10 minutes to put this ship together and now I have to learn the game. * Carcassonne Gold Rush: Another Carcassonne variant! This is a good way to keep the game’s brand fresh without it just being constant expansion releases for the base game. This has some transport building (railways), sort of cities (rail terminiuses that must be completed for points), prairies (where you score for what’s in the fields, not what they surround), and also building up mountains to get gold nugget tokens. I did woefully because I didn’t finish up my mountains quickly enough to stop people poaching my gold tokens! But it was a cool game. Cowboy meeples! 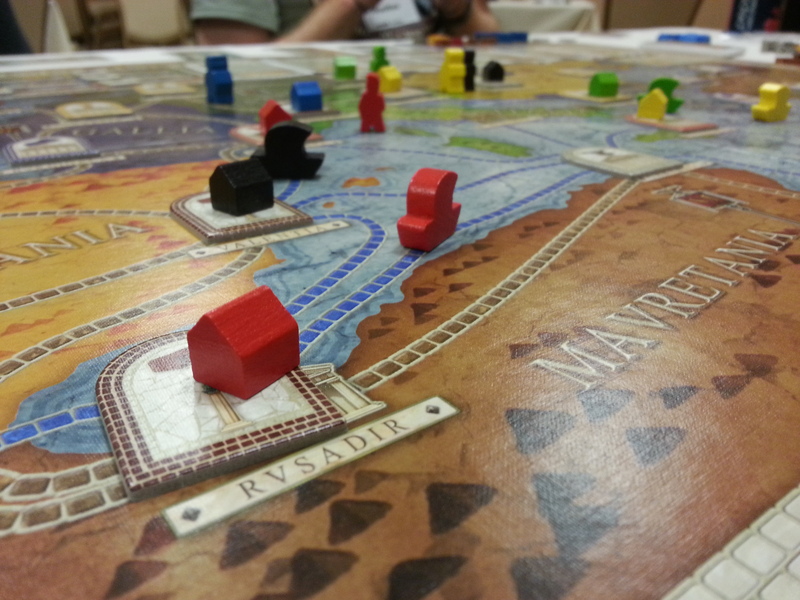 Carcassonne: Gold Rush. Neat little variant. * Akrotiri: More excellent design from Canadian designers Jay and Sen. This has gorgeous art, and it’s a really lovely and simple two-player game. Slowly building up the map/board, picking up and delivering resources and trying to figure out where temples are according to the secret maps in your hand to gain points! So neat. We just got a comp copy of this so I can’t wait to get a full game of it in. * Strike a Pose – Charades on freeze-frame. One person randomly deals each other player a number – the number corresponds to a list of things within a category. For instance “Terrible Jobs”, “Types of woodworking” etc. Each player looks at their number a “strikes a pose” to best represent it. The judge then takes a look at everyone’s poses to try and determine who corresponds to which item on the list. Very light & fun, I could see this being a fun filler/casual game to have on the shelf. Out of all those, I’d say my favourite 5 were: Castles of Mad King Ludwig, Sushi Go, One Night Ultimate Werewolf, Istanbul & Pandemic the Cure. It’s tough to pick, though. What I wish I’d played: wishlist of what didn’t I get to play from 2014 releases that I really want to! There’s a bunch I still haven’t gotten around to, as you can see..
* Scoville – but I’ll be getting my Kickstarter version soon! * Spyfall – I’m curious to see what this online implementation is like, too. * Roll Through the Ages: Iron Age – I know it’s probably not that different to the previous one, but I am still curious. * Nations the Dice Game.. maybe I should also try Nations the regular game. Hehe. 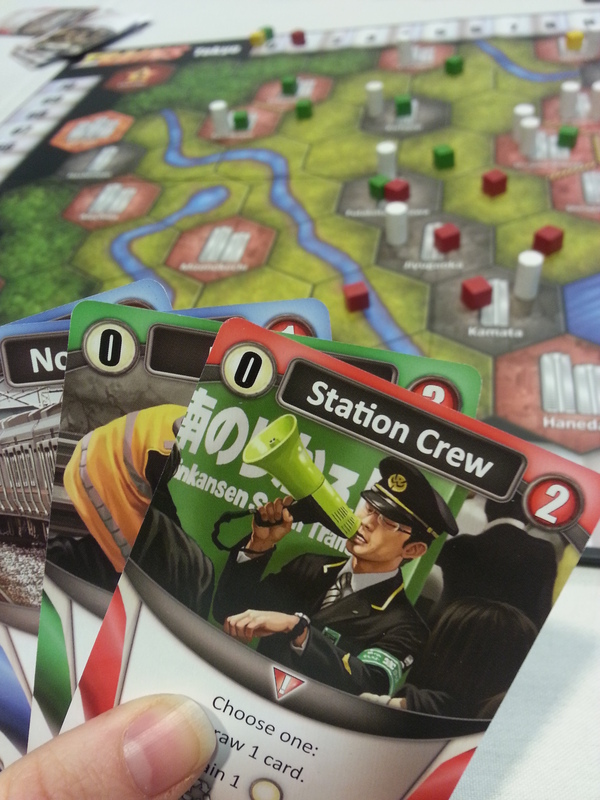 * Panamax – the Twitters are alive with raving about this game. * Diamonds – sounds like fun filler! * Red7 – I just want to try this to know if the hype is real. * VivaJava Dice – coffee and dice!! What are your fave releases/games you want to try from 2014? Up next time: what was new to me in 2014 that was from previous years, because it’s not all about freshly released stuff.